(MoneyWatch) Warnings about the adverse health impact of sedentary workplace behaviors have been all over the news lately. For instance, sitting more than six hours per day makes you 40 percent likelier to die within 15 years than someone who sits less than three hours, according to one recent infographic -- even if you exercise. What's wrong with sitting? The effects of spending too much time in a chair are manifold. Electrical activity in leg muscles shuts down; your body effectively stops burning calories; enzymes that break down fat drop by 90 percent; HDL cholesterol production drops by 20 percent; and the risk of diabetes increases 24 percent. Adopting any one posture for a long time is bad, says Jane White from the Institution of Occupational Safety and Health. "Some of the [Metropolitan Police Service officers] recently collapsed at a passing out ceremony from standing up for too long. It's being static that's the health issue -- it slows down the circulatory system, blood, oxygen, and vital nutrients." - Ask your company whether it will invest in a stand-up desk for you. Some businesses will, especially if you provide a note from your doctor. - Stand whenever you can. If you're not typing at your PC, work standing up. You can stand to take phone calls, for example. - Hold walking meetings. My manager and I recently started conducting our weekly meetings outdoors by taking a long walk between our office and the beach (and back again). Not everyone is situated in scenic Santa Monica, Calif., of course, but walking somewhere while you talk business can be a good thing. - Hold standing meetings. This may have the added benefit of making gatherings shorter, which is great because everyone hates long meetings. 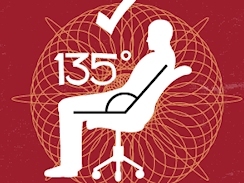 Do you have any strategies for sitting less at work? Sound off in the comments.